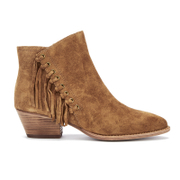 Women's 'Lenny' ankle boots from Ash with premium suede uppers and Western-inspired tassel detailing. 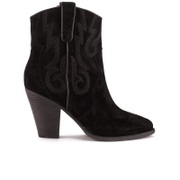 Set upon a stacked Cuban heel and leather sole, the boots feature a pointed toe and side zip fastening for easy access. Complete with gold-toned eyelets and a comfortable leather lining. Upper: Suede. Sole: Leather. 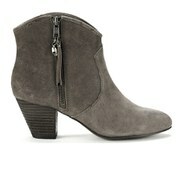 Heel Height: 2 Please Note: Ash ankle boots fit true to size. If you are between sizes, we advise you to buy a size larger than you normally would for the perfect fit.